Global Woodfree Risk of Closure - Fastmarkets RISI - Objective Insight. Better Decisions. The impact of electronic media on woodfree paper end-uses over the next five years will pressure producers to continue removing capacity from the market. 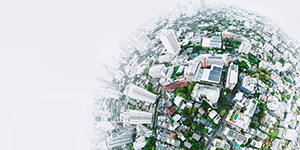 In developed regions, producers will make closures to keep pace with demand declines, while an oversupplied market will motivate reductions in Asia. International Paper’s recent announcement to close its large mill in Courtland, Alabama, USA will remove 862,000 tonnes of freesheet capacity from the North American market. The production costs for this mill are some of the lowest in its market, so its proactive closure was primarily motivated by strategic reasons. Fastmarkets RISI’s Global Woodfree Risk of Closure Study is a comprehensive risk assessment of the major woodfree paper mills around the world. It examines not only machine and mill level risks, but also company-level risk factors for producers of commodity grades of uncoated and coated woodfree papers. These factors can indicate a company’s likelihood to close for strategic reasons and/or machine viability. The study analyzes demand, trade and market balance prospects for North America, Europe and Asia to forecast the amount of closures needed over the next five years. It focuses on declining or oversupplied markets where most of the shuts are likely to occur. 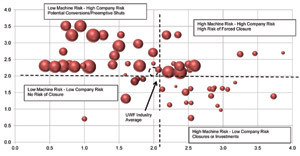 The Global Woodfree Risk of Closure Study uses a range of company and machine risk criteria to identify the woodfree machines and mills most likely to close by 2018 in North America, Europe and Asia. The methodology indicates likely closures, both financially forced and proactive; as well as potential conversions and divestments. Fastmarkets RISI has developed a methodology that involves a quantitative system for ranking closure risk, backed by on-the-ground knowledge of the mills. This methodology will help prepare suppliers to the industry, financial companies, paper buyers and producers for possible closures. 3) The Company and Machine Risk metrics are then evaluated for both coated woodfree and uncoated woodfree papers, and compared to the industry average risk for each grade, to rank the machines most at risk of closure. The methodology separates machines likely to face planned closure, closures because of bankruptcy, or closures in relation to divestment or other major industry restructuring. Fastmarkets RISI is also publishing a Global BHKP Pulp Mill Risk Study, allowing us to offer an even more informed perspective on pulp and fiber risks to woodfree production.